I transfer two MOV movies to my The Nokia 8, but it can’t read this MOV files, why? How to play AVI movies on The Nokia 8? How to play VOB movies on The Nokia 8? Can I play MKV movies on The Nokia 8? Purchased Dead Man Down from iTunes store, I want to play iTunes movies on The Nokia 8, but M4V is not The Nokia 8 compatible format? What video format is the best video format for Nokia 8? For watching movies on The Nokia 8, we should to know what video format can play on The Nokia 8. Nokia 8's great screen makes enjoying HD movies on Nokia 8 a fantasitic experience. But how can we play all videos like MKV, MOV, M4V, FLV, VOB, DAV, AVI, etc on Nokia 8 without curbs? You need to know of what formats can play on Nokia 8. Obviously, this mobile phone supports limited video formats. For playing all movis such as DVD, MKV, MOV, AVI, WMV, FLV, VOB, DAV movies on Nokia 8, you have to convert these files to Nokia 8 supported formats via third-party software. Pavtube Video Converter Ultimate is a handy video converter that convert any video to Nokia playable format. Moreover, you also can convert DVD/BD, MKV, AVI, HEVC, MOV, M4V, FLV, MPG etc to H.265 MP4 for playback on Nokia 8. If you are running Mac system, you can get Mac version for this Nokia 8 video converter - Pavtube iMedia Converter for Mac. If you long for adjusting video parameters, good news, the program grants you to do this change. 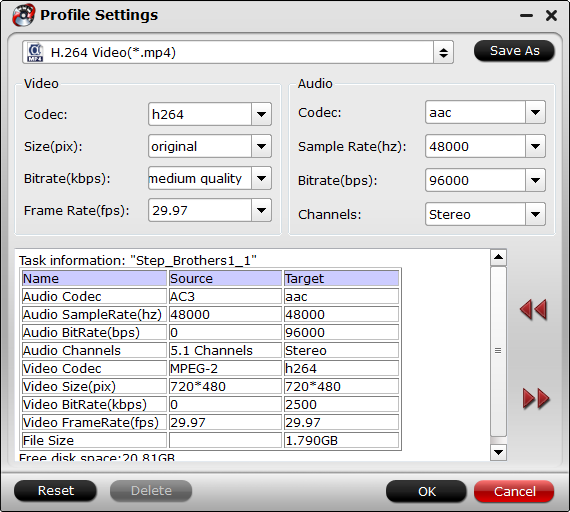 In the Profile Seetings window, you are able to do some change to your video audio codec, bit rate, frame rate, channels, and more. Meanwhile, the feature-rich tool also works as a professional video editor which grants you to change video effects, trim or crop video, add image/text watermark to video, or add external subtitles to the video. See more details here. Run the program and click Add Video button to load video files from your computer or devices. Alternatively, you can first locate the videos you want to convert and then directly drag them to the video list pane. Click format up-down bar, you will see hundreds video formats and optimized device presets here. Just according to your own needs to select H.264 MP4 from "Common Video" category. Tips: Once you define the output video format, then go to Profile Settings by click Settings on the UI, in the pop-up window, you are able to do some change to the video audio codec, bit rate, frame rate, resolution, channels, and more. Up to now, you may have done all things, the left thing is to start the video to Nokia 8 conversion by pressing the red button Convert, wait for a while, go to Open and in the pop-up folder, you can see the generated file. Now you are free to transfer the converted file to your Nokia 8 without hassle.